Double click any word on this page for definition. Disclaimer The geographic center of Alabama is located in Chilton County, 12 miles southwest of Clanton. Borders Alabama is bordered by Tennessee on the north, Georgia on the east, Florida and the Gulf of Mexico on the south and Mississippi on the west. Total area Alabama covers approximately 52,423 square miles, ranking it 30th among the 50 states. Land area Approximately 50,750 square miles of Alabama are land areas. Water area Approximately 1,673 square miles of Alabama are covered by water. Highest point The highest point in Alabama is Cheaha Mountain, at 2,407 feet above sea level. The name is from the Creek Indian word meaning "high place." Lowest point The lowest point in Alabama is Gulf of Mexico. Mean elevation Between the highest point and the lowest point in Alabama, the mean elevation of the state of is 500 feet above sea level. Major rivers Great Seal of the State of Alabama. Major lakes Guntersville Lake, Wilson Lake, Lake Martin, West Point Lake, Lewis Smith Lake. 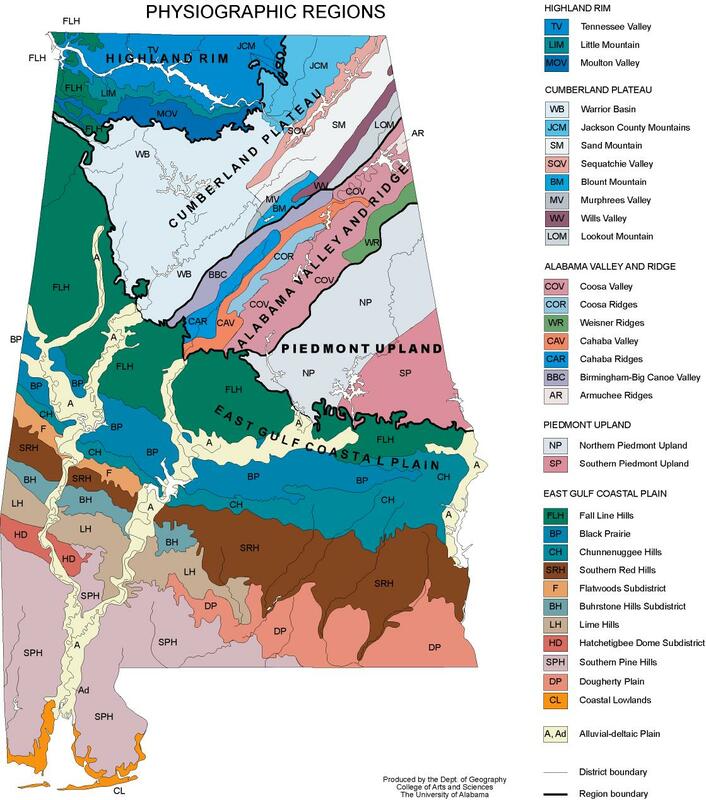 Alabama is comprised of coastal plains at the Gulf of Mexico turning to hills and broken terrain in the north. Five major land areas make up the Alabama landscape with more than two thirds of the state covered by the East Gulf Coastal Plain. The East Gulf Coastal Plain covers the southern two thirds of the state, except for the Black Belt Prairie. But more on that later. On the western side of the state the East Gulf Coastal Plain runs north almost to the Tennessee border. The East Gulf Coastal Plain itself is composed of varying landscapes. In the southwest around Mobile, the land is low and swampy. The southeast plain is called the wiregrass section because of the tough grass that once grew there among the pine forests. These days, the southeastern section has become an important farming area in the state. To the north, the terrain becomes hilly and is covered by many pine forests. This area is often called the Central Pine Belt. The Black Belt Prairie cuts a path between the southern and northern East Coastal Plain. The Black Belt Prairie was the home of many of Alabama's large plantations. The soil in this swath of rolling hills is black and sticky and supported acres and acres of cotton crop until the boll weevils visit in 1915. 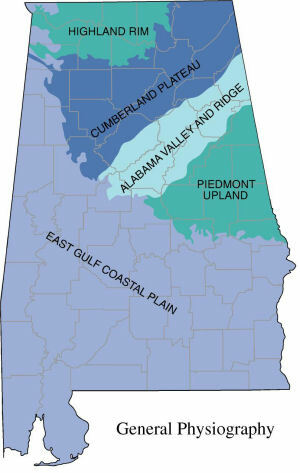 The Piedmont is located in the eastern central section of Alabama and consists of low hills, ridges, and sandy valleys. Coal, iron ore, limestone, and marble are found in this area of Alabama along with Cheaha Mountain, Alabama's highest point. Northwest of the Piedmont lies the Appalachian Ridge and Valley region of Alabama. This region is comprised of sandstone ridges and fertile limestone valleys. The three ingredients for steel manufacture, coal, iron ore, and limestone are found in abundance in this area. Sometimes called the Appalachian Plateau, the Cumberland Plateau lies to the northwest of the Appalachian Ridge and Valley region. The rolling terrain and flat areas rises to1,800 feet above sea level in the northeast and slopes southwest down to about 500 feet above sea level to meet the East Gulf Coastal Plain. 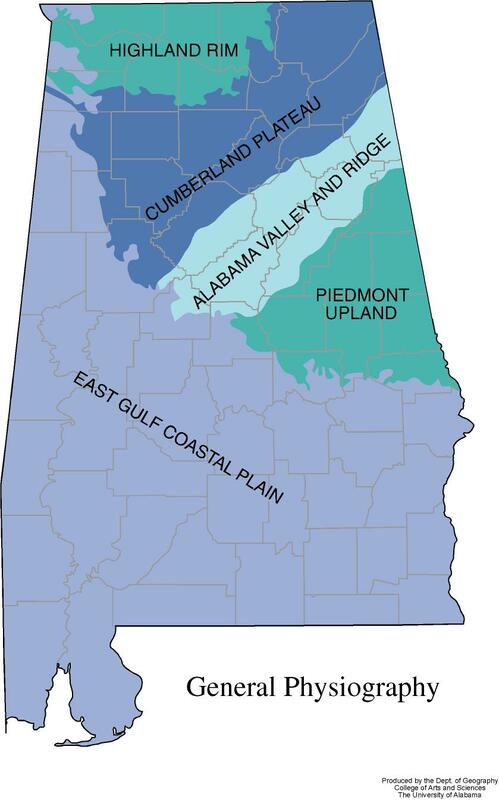 In the northwestern corner of Alabama is the Highland Rim or Low Interior Plateau. A lot of this land is in the Tennessee River valley and farms grow corn, cotton, and hay in this area. The highest temperature recorded in Alabama is 112°, Fahrenheit. This record high was recorded on September 5, 1925 at Centerville. The lowest temperature in Alabama, -27°, was recorded on January 30, 1966 at New Market. Monthly average temperatures range from a high of 91.5 degrees to a low of 30.0 degrees. Average yearly precipitation for Alabama is shown on this chart from Oregon State University. Carpenter, Allan & Provose, Carl. The World Almanac® of the U.S.A.. World Almanac Books . Mahwah, N.J., 1996. David C. Weaver and William D. Barnard, "Alabama," World Book Online Americas Edition, August 14, 2001. Alabama . A. Chicago: World Book, Inc., 1988. 262. Print. The United States Geological Survey Website, August 1, 2001. Alabama Tourism Department & Travel - Official Web Site, August 1, 2001.